"PLEASE SPONSOR A CHILD TODAY"
As you exchange letters, send photos and offer and encouragement in Jesus’ Name. Your love will bring hope to a child’s fragile spirit that will last a life time, Sponsor a child Today! I Emmanuel Nethala, represents Grace Children’s Orphanage, as Vice-President and Correspondent, take the pleasure in presenting a brief report of the orphanage, located in BHIMAVARAM, West Godavari District, Andhra Pradesh, South India. This orphanage is started in 1996 by Pastor N. J. David Raju, as the Founder President. This organization has been registered in the A.P. Government and we received the registered Charity Number 010170148, Rajahmundry. Ever since this ministry is running on hope and faith in the Lord and it has been successfully catering to the needs of the orphan children and in addition the widows. We Praise God for His marvellous and miraculous way. It is an amazing experience to serve the deprived children and destitute widows. 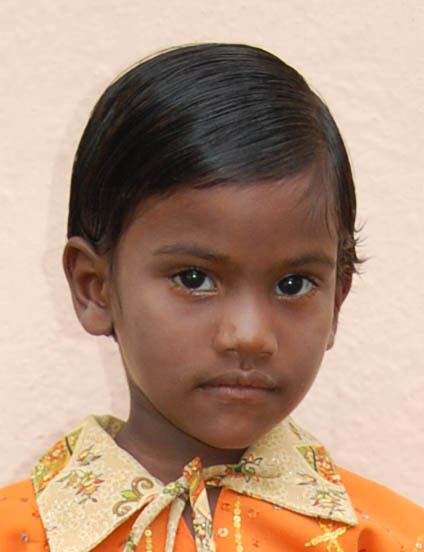 At present we have 75 orphan children out of which we have 39 boys and 36 girls. They are all lovely and wonderful children but they come from the lowest economical background and poorest status. Hereunder, we are giving the details for your information and activation as it is we do not have regular sponsors for these children which makes us worried because the days are so bad that cost of living has become three times or four times increased in prices. In a crucial time where things have become dear we prostrate before God pleading Him to provide us means for the children and widows. The Lord is so gracious in caring for these unfortunate beautiful children and the widows in the orphanage. Nevertheless, we need your prayers. Your prayers will work wonders in supplying the needs for our ministry I know, and confidently say dear brother and dear Sister, we want you to sponsor at least one or two children at your choice because it will cost you only $40 per month for each child.